Have You Heard About Omnilux Yet? Omnilux LED Light therapy is one of the buzzwords in beauty right now and has been for several years thanks to its extensive lists of benefits and its ever-growing celebrity fan base. It’s pain free, non-invasive and requires no downtime, unlike Laser or IPL. It helps with anti-aging, wrinkle reduction and skin rejuvenation. The different wavelengths stimulate collagen and elastin production, accelerates wound healing and can even kill p-acne bacteria. While there are many LED light treatments available on the market, not all are equal. Omnilux was developed in the UK after 12 years of extensive medical research and is used globally by thousands of skin clinics, dermatologists and cosmetic surgeons. The safety and efficacy of Omnilux is well documented and substantiated by over a decade of clinical evidence with numerous clinical studies showing an 80% improvement in fine lines and wrinkles. Drastic results have also been documented for treatment of acne and aiding wound healing. The Omnilux machine itself is a 3 head device that can treat all skin types using light emitting diodes (LEDs) at a specific wavelength and intensity. The different device heads emit different wavelengths to target different areas of the skin. The Revive Light energizes, rejuvenates and stimulates fibroblast activity to naturally boost production of collagen and elastin. The Plus Light is used in combination with the Revive Light for skin rejuvenation and is also fantastic for wound healing. The Blue Light kills acne causing bacteria while reducing inflammation. 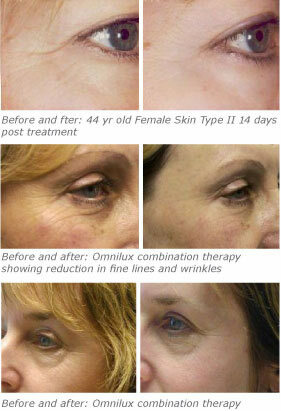 Treatments take only half an hour and the Omnilux light itself is active for twenty minutes. Skin will appear clearer and brighter after just one treatment however a course of 3–9 treatments is recommended for maximum, long-lasting results. Upon consultation our expert therapists will design the perfect Omnilux treatment combination to address your skin concerns and achieve the best possible results. Why not experience the results of Omnilux today?